***Susan's Note: Not for the weak of heart! I first had this when I worked at IU in 2005. John Scully of the Registrar's office brought it in. Wow. Chocolate lovers will adore this dessert. The edges and top develop a delicately crisp crust while the center remains moist and fudgy. 1. Preheat oven to 275 degrees; with rack in center. Butter a 9-inch springform pan. Place butter and chocolate in a large bowl. Microwave in 30-second increments, stirring each time, until melted; cool slightly. Whisk in yolks. 2. In another bowl, beat egg whites to soft peaks. Gradually add sugar; beat until stiff and glossy. Whisk 1/4 of whites into chocolate mixture; gently fold mixture into remaining whites. 3. Pour into prepared pan; smooth top. Bake until cake pulls away from sides of pan and is just set in center, 45 to 50 minutes. Cool completely on a wire rack. Serve dusted with confectioners' sugar. ***Susan's Note: Since I try not to eat ground beef, I have made this with "vegetarian ground meat" such as Gimme Lean, and it is delicious. You could also use ground turkey or Light Velveeta. BROWN meat in large saucepan; drain. Stir in water, tomatoes, carrots, mushrooms, barley, garlic and oregano. BRING to boil. Reduce heat to low; cover. Simmer 10 minutes or until barley is tender. ADD VELVEETA; stir until melted. Prepare as directed, using VELVEETA Made With 2% Milk Reduced Fat Pasteurized Prepared Cheese Product. Sprinkle with chopped fresh parsley just before serving. This recipe is based on a recipe I found in Everyday Food magazine - a great holiday treat! melted, about 1 minute. Remove; stir until smooth. and, using a spoon, coat each 3/4 of the way up. - Sprinkle crushed candy bars and press gently into softened chocolate. - Sprinkle holiday sprinkles or rainbow sprinkles over chocolate. - Pour on many mini m&ms - freeze to harden! Shake off excess. - Melt white chocolate chips. Use spoon to drizzle over pretzels. - Melt KRAFT caramels and add 2 tbs of water. Drizzle over pretzels. **Susan's Note: I had this as a side dish at a football party - really yummy! This is a recipe from Mrs. D.
1 lb. tortellini pasta (can be cheese stuffed, frozen or fresh )- I used the tri color fresh cheese stuffed Buitoni (spelling ?) that you get in the fresh cheese section. Boil tortellini according to package directions. Drain. Mix with other ingredients, chill. Serves 10-12. **Susan's note: I didn't have a removable-bottom 9 inch tart pan, so I used a 11 (12?) inch round tart pan. I used Nabisco "Famous Chocolate Wafers" found in the ice cream topping section of my local Pathmark. The only trouble I had was removing it from the pan - even though I sprayed it with nonstick cooking spray, it stuck. Next time I would let it warm to room temperature and perhaps line pan with tinfoil so I could pop the tart out. This was yummy! Chocolate flatters the sweetness of pumpkin in this sophisticated alternative to pumpkin pie. A rich layer of melted chocolate keeps the crust crisp. 1. Preheat oven to 350 degrees. In a food processor, pulse cookies and sugar until finely ground. Add butter; pulse until crumbs are moistened. Using the bottom of a dry measuring cup, press crumbs into bottom (but not sides) of a 9-inch removable-bottom tart pan. Place tart pan on a rimmed baking sheet; bake until set, about 12 minutes. 2. 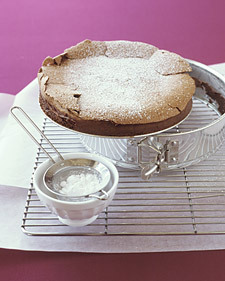 Pour chocolate onto warm crust; spread with a spatula. Freeze until chocolate is firm, about 5 minutes. Brush sides of tart pan with butter; set aside. 3. In a bowl, whisk together pumpkin, egg, cream, sugar, maple syrup, pumpkin-pie spice, and salt. Pour filling into prepared crust; bake on a rimmed baking sheet until set, 45 to 50 minutes. Cool 1 hour at room temperature; refrigerate 1 hour (or up to 1 day). 4. Unmold tart (if sides stick, gently loosen with a knife). With two thin metal spatulas, transfer to a platter. ***Susan's Note: This recipe was adapted from the Neely's Food Network Recipe. I made half of this batch with bacon, the other half without (for some vegetarian family members) and I packed it all in an oversized casserole dish. Yum! Beware: If you use the white/wheat bread Pepperidge Farm mix, you'll need more chicken broth. I liked that this recipe had less butter than other recipes I've seen. Cook bacon in a heavy skillet until crisp. Turn heat down and add onions and celery; saute until tender, about 6 minutes. Add the thyme and rosemary and saute until fragrant. In a large bowl, combine the stuffing mix, bacon and vegetables, and chicken broth. Moisten thoroughly. Add to a 13 x 9 x 2 (or slightly larger) casserole dish. Add pats of butter to the top of the casserole and cover with foil. Bake for 30 minutes then remove foil and cook until top is crisp, about 15 more minutes. **Susan's note: This was yummy for a cold night. I used 33% less fat bacon instead of pancetta. I used mostly skim, a little bit of whole milk. I made a little extra cheese sauce because I didn't want it to be dry. I used chicken broth instead of white wine. I used the healthy "smart" pasta. Bring a large pot of water to a boil, salt it, cook pasta to just shy of al dente. Chop pancetta into 1/4-inch dice. While pasta cooks, heat a skillet with olive oil over medium to medium-high heat. Add pancetta, cook 2 to 3 minutes then add celery, carrot, onions, garlic, rosemary, thyme and bay leaf to the skillet, season with salt and pepper. Saute the vegetables until tender, 6 to 7 minutes. Add beans and heat them through. Stir in 1/2 cup wine, simmer 30 seconds more and turn off heat. Remove bay leaf. While vegetables cook, place a small sauce pot over medium heat, add butter, melt butter then whisk in flour and cook 1 minute then whisk in milk. Season sauce with salt, pepper and nutmeg and reduce 4 to 5 minutes, stir in half the grated cheese, turn off heat and adjust seasoning. While sauce cooks, place a rack in the middle of the oven and preheat broiler to high. Drain pasta and return to the pot, toss with white bean mixture and sauce, stir to coat, transfer to a casserole dish, top with remaining cheese and place in oven to brown, 5 minutes.